Today was the first time Delaney noticed the birthmark on her face. We were playing at a friend’s house, and after washing her hands in front of a mirror, Delaney examined her face. She pointed it out to me and asked what it was. “It’s a kissmark,” I immediately replied — spontaneously giving it a personal label that fits with the philosophy of our family. Dell points out the kissmark on the side of her mouth. It’s true that Dell’s mark is a kissmark. It’s attached to her chubby cheeks in such close proximity to her mouth and neck and is the perfect target for my lips. I’m frequently overwhelmed with Delaney’s cuteness and want to shower her with kisses. Now I have a great excuse, and I can request Dell’s permission to kiss her kissmark. 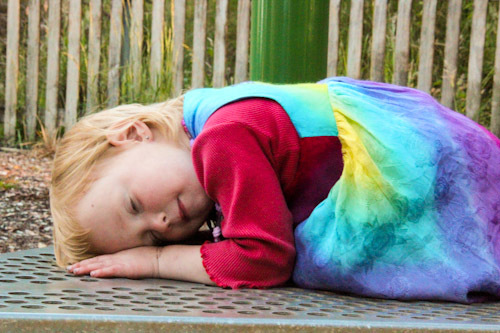 As part of her game on the playground, Delaney pretends to sleep until the rooster crows. I am enjoying her at this age so much where she's still so cuddly and yet can enter into more sophisticated conversations. I still remember the moment I first noticed Dell’s kissmark. We were still living in our house, Dell was several weeks old, and I became distressed because I thought it was a bruise. Upon closer examination, I saw it was just a pigmentation of the skin. The kissmark is evident in early photos of Delaney. Dell’s kissmark raises issues for me. Facial pigmentation like this reminds me of how I was teased about my freckles. My freckles set me apart from my mono-complexioned peers at school, and in school that’s not a good thing. 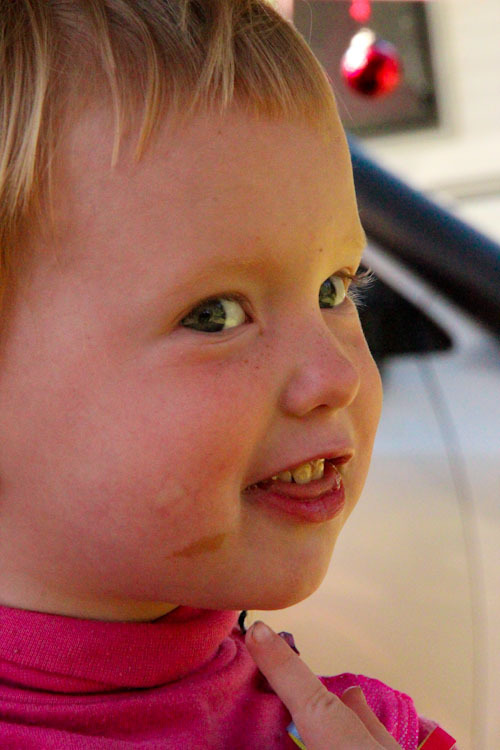 Now I don’t worry about our girls’ attraction to freckles — we’re surrounded by a nation of healthy, freckly faces — but Dell’s kissmark is something different. I’d love Delaney to own her kissmark as the mark of a princess, a brand that may set her apart from her peers, but in a good way. I believe that in reinforcing Dell’s unique beauty at this young age, starting with calling her birthmark a “kissmark”, I’ll be giving her a foundation for understanding her value comes from within and not from outside herself. And I’m going to keep kissing Dell’s kissmark. I can’t resist it anyhow. And one day it’ll be just as irresistible to her partner as it is to me. My Elijah has a spot on his head that we call his “angel kiss”. No hair has ever grown there. Although he had a full thick head of hair upon his birth I quickly noticed there was no hair there. I told him an angel kissed him when he was born. Since he was born at 30 weeks and did so well initially, there’s a good chance the angels were there that morning! I’m confident you’ve got this, and are saying and doing all you need to as her mama to help her on her way to being a girl who’s just right in her skin… I had a birthmark grow on my forehead when I was 3; my mother’s initial response was the same as urs and she scrubbed hard!!! When she realised it was going nowhere, she set about covering it up… for 11 years, until she had it surgically removed after a distressing time for me being harassed about it. I was always ‘made’ to feel like it was ugly, and it caused HUGE issues for me growing up, and even after it was no longer there… My darling Elijah was born almost 12 years ago with a noticeable bump on his bottom lip – a harmless cyst. I, like Sandy who commented above, called it his “Angel Kiss”. When he was 4, he asked what it was and I told him it’s an “Angel Kiss” and explained that i believe an Angel left her kiss in his lip to remind him of how beautifully and wonderfully he was made, and he’s not mentioned it since, and it SO doesn’t detract from his gorgeousness, as is the case with ur beautiful Dell. Like you, I too am a red-head with many freckles. And it was not fun in school. Red hair, freckles, spaced front teeth and then braces! Not fun times! But growing up my mom called them angel kisses. Now with my son I too call his so cute freckles, angel kisses. And he thinks nothing of them except to tell me how much the angels love to kiss him when he is sleeeping. I agree with above comment, you are doing well to teach her to love her kissmark.